Do you sing or play an instrument? If you do, these books are for you! They include the melodies, lyrics, and chords symbols for your favorite songs, all in a convenient, pocket-sized book. Using these accurate, fake book-style arrangements, anyone from hobbyists to professionals can strum on the guitar, play melodies on the piano, or sing the lyrics to great songs. Books also include a helpful guitar chord chart. The Paperback Songs series books are a fantastic dealt! 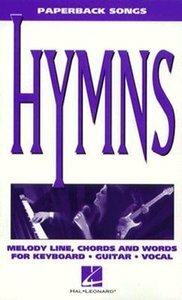 Prepacks are also available.An excellent collection of over 150 favorite hymns, including: Abide with Me-- All Creatures of Our God and King-- All Hail the Power of Jesus' Name-- Amazing Grace-- Beautiful Savior-- Crown Him with Many Crowns-- Faith of Our Fathers-- Holy, Holy, Holy-- In the Garden-- Nearer My God to Thee-- Rock of Ages-- Thine Is the Glory-- more. - Publisher A convenient collection of over 200 songs, including: Ah, Holy Jesus * Amazing Grace * Be Thou My Vision * Blessed Assurance * Blest Be the Tie That Binds * The Church's One Foundation * Crown Him With Many Crowns * Faith of Our Fathers * How Firm a Foundation * I Love to Tell the Story * It Is Well With My Soul * Just As I Am * A Mighty Fortress Is Our God * Morning Has Broken * The Old Rugged Cross * Onward Christian Soldiers * Rock of Ages * We Gather Together * What a Friend We Have in Jesus * and more. A convenient collection of over 200 songs, including: Ah, Holy Jesus * Amazing Grace * Be Thou My Vision * Blessed Assurance * Blest Be the Tie That Binds * The Church's One Foundation * Crown Him With Many Crowns * Faith of Our Fathers * How Firm a Foundation * I Love to Tell the Story * It Is Well With My Soul * Just As I Am * A Mighty Fortress Is Our God * Morning Has Broken * The Old Rugged Cross * Onward Christian Soldiers * Rock of Ages * We Gather Together * What a Friend We Have in Jesus * and more.